Junior Tim Schreffl, a midfielder for the Miner men’s soccer team, grew up with a passion for sports in a tight-knit family in Germany. After seven months in Milwaukee as a high school foreign exchange student, he knew his dream was to live in the United States. A college education would have been free for him in Germany, but to come to an American university he had to find a scholarship. “To my advantage, I was playing soccer on a really high level in Europe, which made it kind of easy to get a good scholarship offer from colleges in the U.S.,” Schreffl says. After receiving offers from universities all across the country, he chose Missouri S&T. 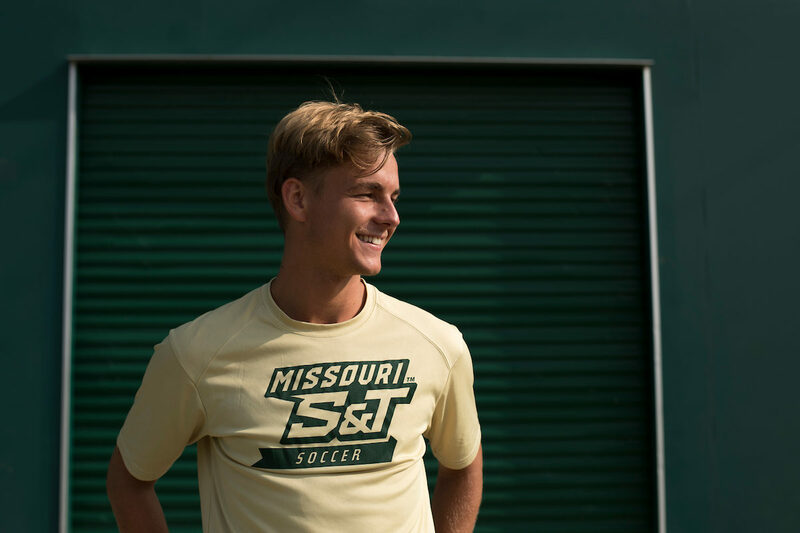 “I looked into the academic programs of the schools that made me an offer and decided that Missouri S&T is the place I want to have a good and successful soccer career and academic career, as well,” he says. Majoring in business with minors in information science and technology and marketing, Schreffl hopes to parlay his education and love of athletics into a job in marketing for a major sports brand. “I can see myself working for Nike or Adidas in the future,” he says. Schreffl is very close to his family, and being so far away is difficult. But he is up for the challenge thanks to support from his S&T family. Schreffl has valued the support and mentorship he has received as an S&T student, and how he’s paying it forward. “S&T members care a lot about the other members’ success, so I definitely learned to not just look out for myself, but look out for others that they can succeed as well,” he says.